U.S. Virgin Islands -- I suspect that when Time magazine chooses their Person of the Year for 2008, there will be little internal debate. They've probably long picked The One -- Barack Obama. After all, more than half the country went and elected him the next president of the United States. And, come to think about it, the ink-stained pundits at Time have already vaulted the former senator from Illinois to top-dog status. When, last December, they declared the 2007 champion "You," they hit on one of the key ingredients to Obama's successful strategy: he was so disciplined, so likable, so broad in his way of speaking that Americans were able to project their hopes and dreams for their country onto him, regardless of what he actually had to offer. Whatever you thought of her, it seemed everyone in the country had an opinion of Palin -- at the very start, throughout, and after the Republicans' failed national campaign. And like Obama, all you had to do was look at her to see that she offered something different on a national ticket. In neither case did I think that novelty alone was a sufficient qualification for executive office, but the sheer innovative force of each was blindingly obvious, and the first things you noticed. Here at National Review's post-election cruise, a group gathered for a weeklong post-mortem on the high seas has Palin on the brain. Palin's not on ship, but neither her absence nor the McCain loss has dampened enthusiasm for her here. On the lighter side, one foreign policy expert showed up for a panel in a towel (but fully clothed underneath) in an act of solidarity with Palin (referencing the now debunked post-election story that she once appeared to top campaign officials in a towel). What is it about Sarah? For many folks on the right, she represented an influx of social conservatism in the campaign. All she had to do was arrive at the scene with her son Trig to demonstrate her pro-life bona fides. Some estimated 90 percent of Americans faced with the knowledge that they might give birth to a child with Down Syndrome wouldn't have made the choice she and her husband, Todd, did to let the child live. For other conservatives, she simply represented anybody but McCain, a stubborn gadfly they had bumped up against more than once on issues of immigration, free speech and even judges. And for some it was the pride she exuded in "this great country" that made her so appealing. Some will to this day compare her to Ronald Reagan. Why is this? It's about her simple and clear patriotism, and, frankly, her forthright belief system compared to a now president-elect who was comfortable being friends with a domestic terrorist. I don't question Obama's patriotism, but to ignore the contrast would be a lie. Like the "change" from the Obama campaign slogan embraced by so many, Palin offered something different. For some it was an anti-Washington feel. Many consider her a refreshing citizen-politician in the old mold, one that Thomas Jefferson would be proud to meet. Does that make her just like Obama? I do wonder what the campaign would have been like had they both been at the helm: He wouldn't have had a monopoly on change, and she would have had her own staff and freedom to follow her instincts, and perhaps better advice than she was given as she ran for vice president. We'll never know what could have been in a straight-on Obama vs. Palin contest. But what we do know is this: Palin, like Obama, energized people. And she did it in a heckuva lot less time than he had to do it, only coming onto the national scene and the GOP ticket Labor Day weekend. It's still a free country. Media outlets still can do as they please (save for those who choose to hand over their editorial direction to one party or another). 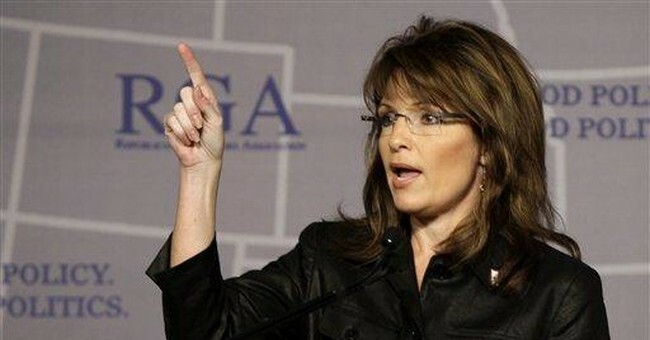 But Time would make a mistake if it ignored the Palin phenom this year just because the ticket didn't win in the end. Obama would be wise to agree.